Feathers: What's flight got to do - got to do with it? 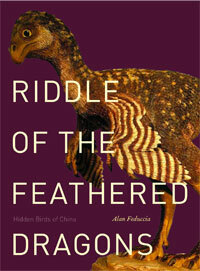 Additional reading on the subject of feathers (in the form of pdf files) is provided at the end of this essay. This is a short introduction to a back and forth (articles in pdf form) about the nature of the fibers associated with Sinosauropteryx. Additional reading on the subject of bird digit identity (in the form of pdf files) is provided at the end of this essay. an update to "Giving Birds The Finger"
We welcome any responses to these essays and articles. Please respond or submit an essay of your own via email. The more contributions with the greatest diversity of views, the better the site will be. Cladistic Existentialism is our term for the view that cladistics is the only legitimate, objective method for doing paleontology. This view has, unfortunately, become quite common in the world of vertebrate paleontology and, in our opinion, threatens to do profound harm to good science. The National Center for the Study of Cladistic Existentialism has been established to engender an honest and serious (but not solemn – witness the flippant name) discussion of the way cladistics has come to dominate in the world of vertebrate paleontology and the ramifications thereof. This will inevitably involve the dispute over the origin of birds as this is where the verbal fisticuffs over cladograms rage most intensely. But cladistics, not bird evolution, is the focus of this site. If you have no idea what all this means but your curiosity is piqued, we have done our best to lay out the issue in normal human-speak on the Background page. We have a T-shirt with the Fred-the-Dinosaur logo on the front and a subversive thought on the back available through our Wearable Propaganda page.